It can be difficult to budget for overdraft interest, since it is dependent on your Cashflow Forecast and your Cashflow Forecast is also dependent on your budget. With the use of a custom KPI Calxa can make this process much easier. This help note will outline the steps and assumes you have some basic knowledge in Creating Custom KPIs, Creating KPI Reports and Editing Budgets. 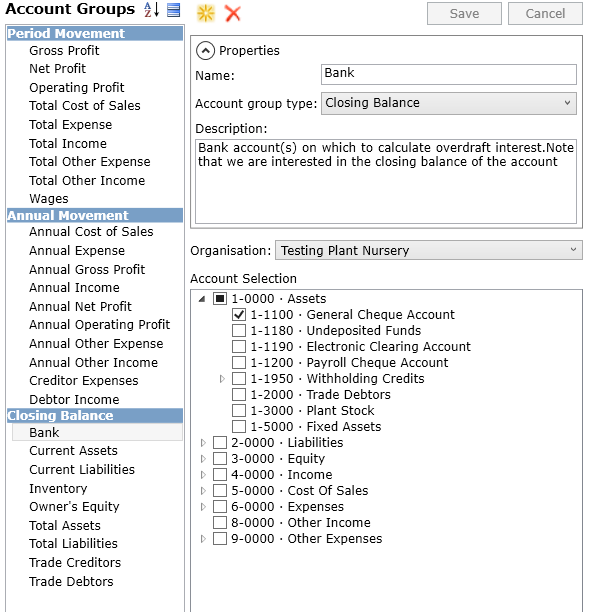 Note: The above formula checks if the projected Bank balance is negative and if so multiplies it by the interest rate. In this example the annual interest rate is 10% and we divide by 12 to get the monthly rate. Note: This report will show the budgeted overdraft interest. Please note that this report will generate different results until the Last Actuals period surpasses the starting period. This is because until that point the closing bank balance for each month is being projected forward from a forecasted beginning of year opening balance which may be different to the actual beginnning of year opening balance when this becomes available. If you wish to reforecast your Overdraft Interest part way through the year simply select the option to Use actuals up to, and the forecast values will then be calculated based on your actual bank closing balance rather than your original budgeted bank balance at that period. Enter the values from the Spreadsheet report into your budget.